You’ve seen it all your life, in Chinese restaurants, Vietnamese spas and basically any Asian related shops. But are you familiar with the true story behind the famous paw-waving golden cat ? 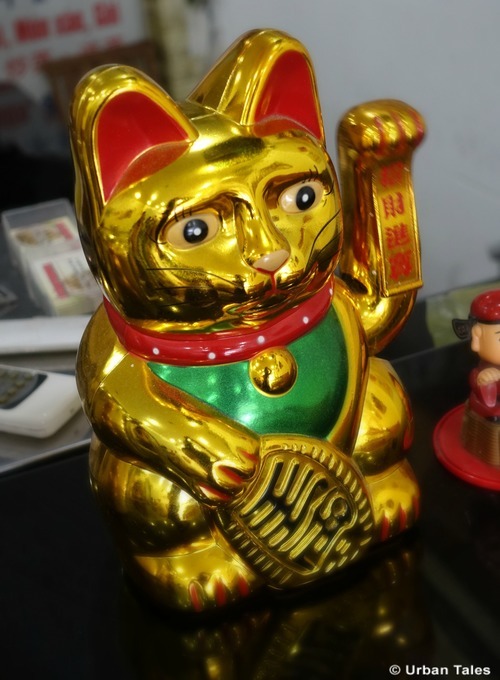 This cat figurine is actually a very popular lucky charm throughout all asian culture. 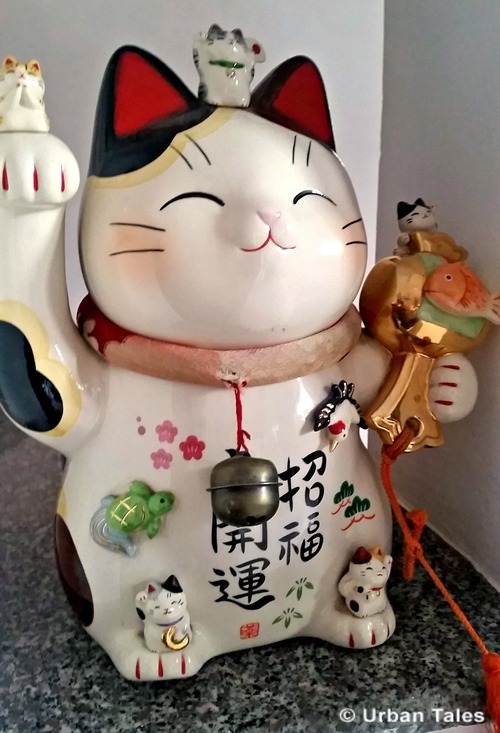 Maneki-neko is its true name (in Japanese: 招き猫) literally meaning “beckoning cat“) as it originally comes from Japan. Its history dates back to the 17th century and it has since become one of the most popular features of Chinese business traditions. It’s believed to bring good luck & prosperity to the owners of the shops and businesses, and that is why it is always displayed next to the cash register. We bet that you probably don’t know that there’s actually a meaning behind which paw the cat is holding up! If it’s the left paw is raise, it is supposed to attract customers. If the right paw is raised, this invites good fortune and money. Colours can be different as well, with different meanings. Most common colours are white, black or gold. White is for general good luck, black is for good physical health & to chase away evil spirits and gold is for financial prosperity. The cats are usually adorned with a bib, a collar, and a bell. In the old times, wealthy Japanese people would dress their pet cats this way using the bell so they could keep track of their cat displacements. The cats are holding in their paws items symbolizing fortune, wealth, abundance and wisdom: usually an ancient Japanese coin, or a magic money mallet but it can be also be a fish carp, a marble or a gem. If you want to bring good luck to your business, why not buy one yourself and give it a try? If you want to dive into the heart of Saigon’s Chinatown, book our self-guided tour and come investigate the strange case of Dr Lam!